Did you know that having a book will help you build your business? Do you want to be “the person who wrote the book on it”? Join with other aspiring authors to create your first or next book! Increasingly, HR and business leaders are understanding the importance embracing the human spirit of their employees to unlock potential and maximize performance and innovation. This volume discusses these issues of well-being, work/life balance, diversity and inclusion, compassionate workplaces, personal and professional development, and spirituality in work. 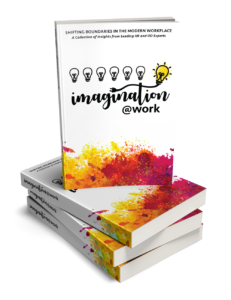 Imagination@Work explores these concepts by sharing the perspectives of 15 to 20 unique business leaders across multiple industries and professional roles, and offers ideas as to how organizations and leaders can unlock the human spirit to create productive and innovative workplaces. We have up to 20 author/chapter spots available. Sign up today and claim your spot by contacting Cathy! Read the Speaker magazine articles about participating in anthologies, written by Compassion@Work authors Stacey Oliver-Knappe and Tonia Morris! Read this blog post on the benefits of writing in an anthology, featuring highlights from the authors. To download a pdf with all the details for this opportunity, follow this link. I just wanted to let you know that I submitted a proposal to speak at the 2019 SHRM conference in Las Vegas, NV — and my proposal was accepted! My topic is on cultural competence. I am so incredibly excited! I will keep you posted, but I just wanted to say thank you! Writing a chapter in “Cultivating Culture” has opened doors for me as a writer and now as a speaker.